I found this 10 miles from home. I had to have it. It is a 1982 GPZ 550 that has been repainted in new camaro green. It started right up and has new tires and wheels. There are a few thing not the way I would like them but it will give me a chance to play with it. I had a 1980 and 1982 KZ550. The first I rode 27,000 miles and the second for 80,000 miles. This one will be mostly just to have it. The seller had a 1979 KZ650 also. 2 of my buddies had that bike. Almost had to snag them both. Something about so many bikes from that era just scream 'take me home'. I had a red one with the blue stripe color combo back in the day, mid to late 80's, great era for bikes! The original color should have been red.The guy I got it from repainted it the green. It looks close to Kawasaki green. I like the look with the stripes on it. I might have to look into the decals. I have the original tall light and missing gpz emblem coming and still need to get the signal lights, grab bar, kickstand switch, and find an owners manual so I know how all the lcd indicators work. Mine is an 82 also but the standard model, not the GpZ, the 550-A, It was originally black with white and silver stripes, I still have all the original body work, I bought it new in Sept. 83 as a left over model for $900. 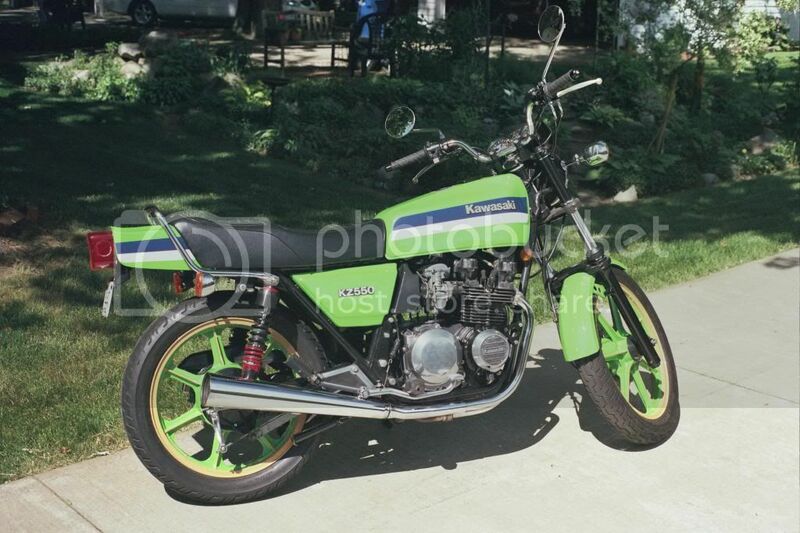 BTW, the stripe kit I have is for a half size Eddie Lawson replica, its made in Canada, I was told they sold a model like that there, although I've never seen one or heard of one or been able to prove it, I think somebody that worked at the sticker place just wanted a half size ELR. I'm not sure the kit will work on your bike as its an 82 GpZ, it will work on the different body work of the 81 Standard and GpZ models. I had the same KZ550-A3. You got a better deal. I got mine in Aug. of 83 for $1000.00 and traded in my 1080 550. I gave it to my brother in law in 93 with 80,000 miles on it.